Clear devicestatus collection records—this makes it easy (and risk-free) to reset the battery % indicator for your uploader phone. Clear future data—future data occurs when a time mismatch happens between the phone and receiver. This problem can happen when changing time zones, when changing times due to Daylight Savings, when a device dies, or through simple error. Finding and removing the future data can now be handled easily. 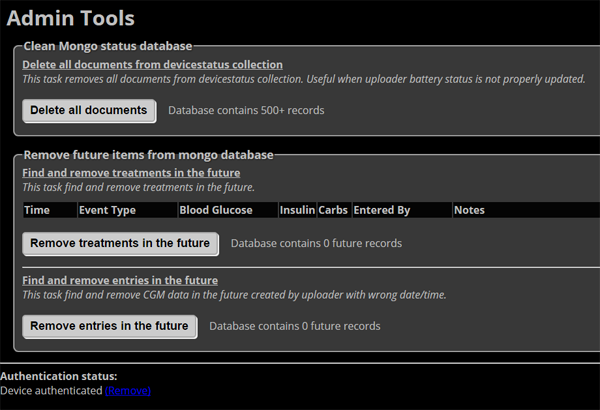 Clear future treatments—find and remove (or edit) CarePortal entries that have been incorrectly entered with a future date/time. 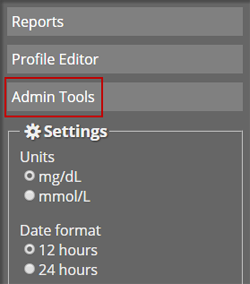 To access the Admin Tools, open the site settings panel (hamburger icon), and choose Admin Tools. The Admin Tools will open in a new browser tab. As described above, these tools helps automate steps that are frequently needed in managing a Nightscout site. Usage of the Admin Tools is self-explanatory. When using any of the tools, you will receive a popup confirmation screen before the request is processed. « Where do I find the 3D printer source files for the Dexcom/Moto G Case?